One of the most important elements of my sabbatical has been rest. I have enjoyed getting a good night’s sleep most nights, especially when I’ve been at home. I’ve realized a number of things about myself in this process. First, I generally don’t get enough rest. I actually tend to sleep pretty well, but I’ve realized that I often don’t really slow down enough to get true rest. While I was at General Assembly in Pittsburgh and traveling in Scotland, I tended to go to bed late and get up early so that I could make the most of my time with these wonderful people and places. It was a great thing to do, and I don’t think I would do it differently if I did it over again. However, during my last few days in Scotland, I realized how much this lack of rest caught up with me. On my last full day in Scotland, I took a three-hour afternoon nap. On two of my three afternoons in Iceland, I also took three-hour naps. Since returning to the US, I’ve continued to sleep more than usual and make up for some of the rest I missed. As I think about doing such a trip again, I’m going to be sure to include more downtime for rest in the middle of the trip so that I can be more energized as it continues. Second, my lack of rest makes a difference for me. While I was deeply energized by all the things and people I was seeing in Scotland and at General Assembly, I also noticed toward the end of all these travels that I was burning out. It was a very similar feeling to what I had been experiencing in my work before my sabbatical began – I was in desperate need of some down time, and the regular moments for that were few and far between. Now that I’ve really started to recover and rest more, I can tell a difference. My friends have noted my restedness lately, and I’m finding that I am just in a more settled and joyous place. So how do these learnings translate into life after sabbatical? I had better figure this out quickly, since it ends next Tuesday! So far, I’m planning to be more careful about taking my days off and more intentional about my sabbath time. It has been easier to disconnect from things this summer without my work email continuing to “ding” away, and I will likely do this more often. I’m also thinking that I will be sure to take vacations that aren’t just filled with family and friend and travel time but also have some downtime on the front end or back end. Maybe instead of going right back to work the morning after returning from a week of travel, I’ll plan to take an extra day of vacation so that I can be more relaxed and rested as I move back into the world. And I suspect that I will also try to have better hours for sleep going forward – though that is easier said than done! Sabbath and rest are continuing challenges in my life, and this time of sabbatical has only highlighted my ongoing issues with how I try to live them out. Nonetheless, I hope and pray that the space I’ve had this summer will help to make the time ahead all the more fulfilling and restful and joyous all the same. A note on the photo: Since I don’t have any pictures of me resting on the trip (surprise, surprise! 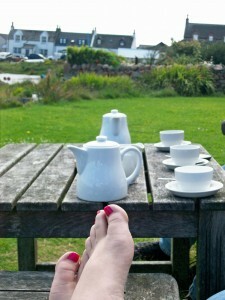 ), I’ve borrowed my friend Teri’s photo of a relaxing afternoon in the garden of the Argyll Hotel on Iona with tea and scones.